We haven't had any new snow for a while now but it appears all that is about to change. Tonight into tomorrow we are forcast for several inches of the white stuff along the seacoast area. Luckily the girls don't have school tomorrow or they would end up with a snow day. 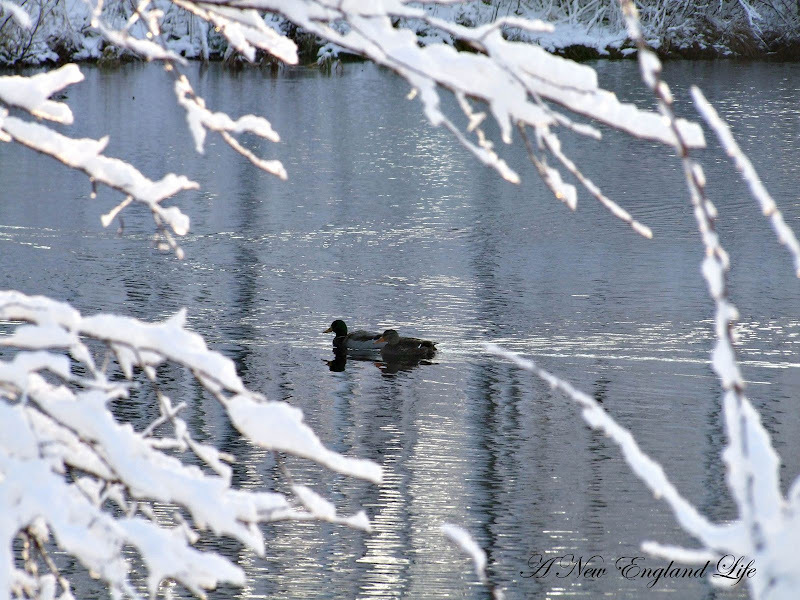 These photos were taken at a small pond fairly close to where I live. It was a sticky, wet snow much like what we're supposed to get tonight. The kind of snow that makes for great winter wonderland views. There's nothing better after a snow storm then when the sun comes out. The whites become whiter and everything glistens like diamonds. Not to mention the blue sky overhead reflecting in the pond offers a nice contrast. The pond has since frozen over. I wish you a peaceful Winters day. These are fantastic photos. 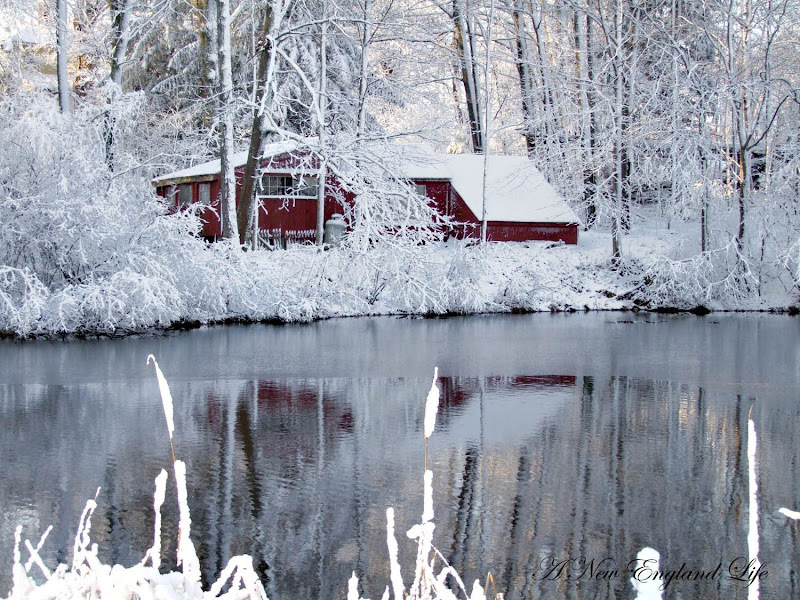 I really love that red house in all that white and the pond glistening is gorgeous. We've had rain here since yesterday evening. No white stuff here, just brown dead grass and plants. I want to move north! These are a great set of snow shots. I like the framing and the framing in the first shot. The third shot has me wondering what's around the corner. An excellent quality in a photo. And the last, who doesn't a snow photo with a red interest item? Just beautiful. I love the photos. Enjoy the snow day! Those are pretty much perfect photos and you make me soooo jealous! Oooh, the little red house. How sweet! Raining here today and it looks like the entire mess is headed your way in the form of snow! Get yer boots on, Girlfriend!! Very pretty and peaceful photos! All our snow melted over the past couple of days. I don't want any more, but I'll enjoy looking at yours! I do love it when the sun shines on snow covered trees and everything glistens! Oh, my gosh! That last photo is magical. Love your photography and all the snow scenes. Beautiful - But it does look cold!. :) Suppose to be in the 50's today, and it has been raining. Thanks for sharing your wonderland! I especially love the last photo and how that red just pops! Wonderful light studies - imagine going through a year without such scenes! I love the little red house in the white woods. Yoour pictures are exceptinal. Not sure what we are going to get here in the Adirondacks. I think it all may go south of us. We've had a wonderful January thaw the past few days. Love your pond photos! Wow! Stunning photos. Very tranquil wintery views. Our snow in the South West, UK, went as quick as it came. Took lots of photos though. More snow for you! Lets hope you're not snowed in. I think snow is beautiful too. It was quite balmy here today - almost like a spring day, but with gray clouds and some much-needed rain. The last two pictures are just breath-taking. Lovely photos--I am hoping for sticky snow--my boy hasn't had the right kind of snow to build a proper snowman yet! I think I may need to come to visit so I can take snow photos. Sharon, they're beautiful! You are brilliant behind that camera. We're having a warmer week - 50's. I'm envious of your snow. You have such a good eye for composition! This series of photos is just stunning and makes me feel as if I am right there. Here in CT we got rain instead of snow last night. It has washed away most of the snow that was on the ground and since temps are a bit warmer has left us with mud. For all of mud seasons drawbacks I still love it because it means spring is somewhere around the corner! As always thanks for sharing your beautiful photos. beautiful, just beautiful and peaceful. thanks for the photos! so simply stunning.....just peaceful and perfect..
and that red house in the white snow...i don't know what to say..
What a wonderful set of pictures--you really captured the mood and the moment! Aw, the beauty of New England! You've captured it so well. If I didn't already live here, I would definitely have it on my must see list. Wonderful little pond! My favourite is the third photo, with the reflection of the snow covered bush! And the blue sky! I am starting to think that blue skies are myths, it has been so long since I have seen one! Beautiful photos. I'm hoping to get out for some nice snowy shots tomorrow, since it's been snowing here all day. STUNNING photos. I really loved these. 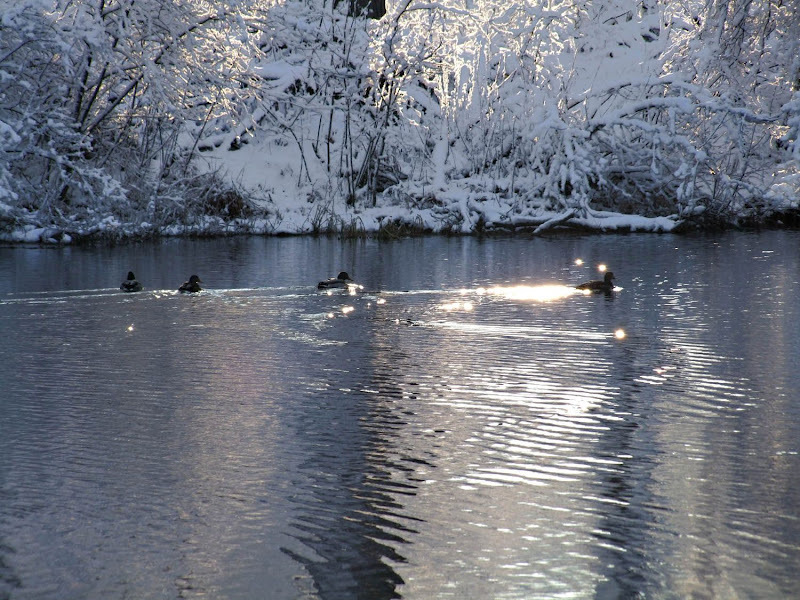 I love the open water with snow pictures and the sun and ducks plus that was awesome....!!!! 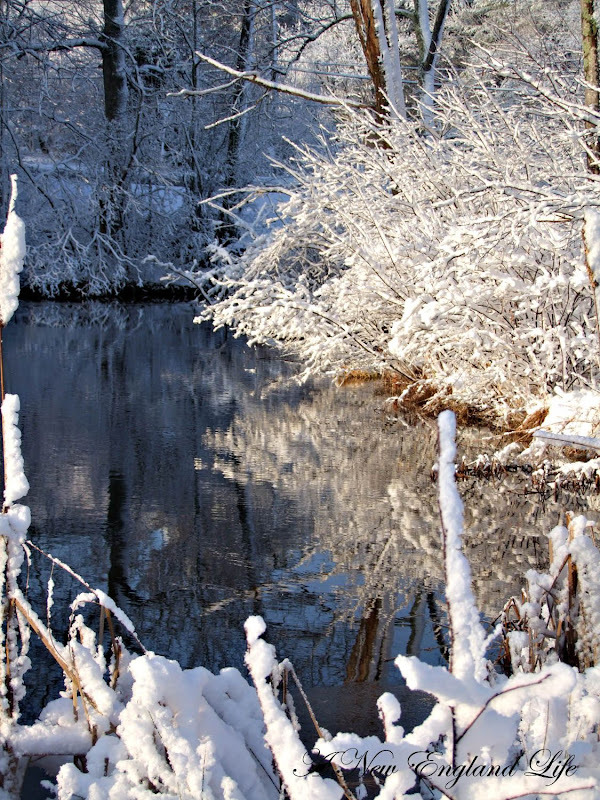 Fab snowy shots, Sharon! I have come out of the dead internet zone..and hope to be among the living internet zone for at least a month now..
We've had no snow for awhile now and I miss it...makes everything look so clean and fresh. It was a sunny day today and would have been a perfect day to take pictures!!! sigh maybe tomorrow!